I am a Biological Oceanographer and my current work is focused on determining the time needed for degradation of the oil spilled from the Deepwater Horizon accident by naturally occurring microorganisms. Degradation in this sense is the assimilation or removal of the oil from the environment. Microorganisms use oil for food and some prefer specific compounds of the oil over others. We look at the various sediment settings and through experiments in the lab and at sea, we can estimate the impacts of future spills. 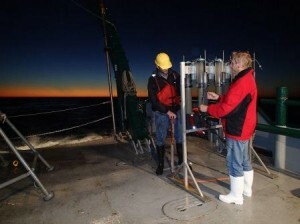 This research cruise is the eighth cruise that I have taken sediment cores from shallow shelf sites and the deep sea. 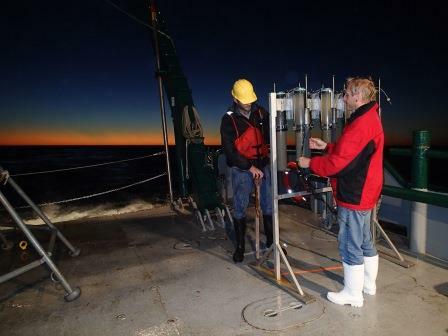 Some of the cores will have oil added to the sediments and we will monitor oxygen consumption and other parameters to quantify microbial respiration. We will also look at the carbon: nitrogen ratios of the sediments back at our lab. Microbial samples will be sent to partner scientist to determine which organisms are responsive to inputs of oil. Cores are used by other scientists to do many different things and we will freeze cores taken on board and distribute to others. I am a native Floridian and have been interested in the ocean my entire life. I have been fortunate to have the opportunity to be a part of the Deep-C consortium through the Gulf of Mexico Research Initiative. My ultimate goal is to do my part to ensure that future generations have the same opportunities to enjoy the Gulf of Mexico as much as I do. My name is Lee Russell and I am currently working towards a PhD at Florida State University. I am a Biological Oceanographer and my main research focus revolves around bubbles. That’s right, bubbles. I came to be involved with this top secret bubble project in a sort of round-about way. After graduating high school, like many people, I had no clue what I wanted to do with my life or remotely what direction I wanted to send it in. Well, that’s not entirely true. I knew I had just been through 12 years of school and I knew I wanted to do some good for people. So I started my undergrad degree in Political Science. By the time senior year came around, I had taken enough classes dealing with environmental science that a double major was possible, so I decided to take a few more classes so that I could double major. With graduation closing in, still having no clue about a life direction, I took a class called “Current Environmental Issues”, taught by an FSU Oceanography professor and things changed. This was the first class that actually “made sense” to me in terms of being applicable to real life. Yes, I finally got inspired my senior year of college. Applying for graduate school at FSU Oceanography has been the most important and easiest decision I have made in my life. 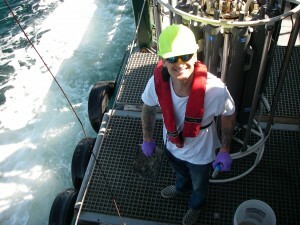 So here I am on the RV Weatherbird II, pulling tubes of mud from the bottom of the sea floor and I couldn’t be happier. You may say “what in the world does that have to do with saving the environment, Lee?”, and you would be right to say that. But it’s not about that. It’s not about mud, bubbles or the manatees. It’s about the explosion of knowledge and the widened perspective I have gained in the past 2-3 years working towards my graduate degree. Maybe I would have come to know some of the things I know now, but not in this accelerated fashion. Graduate school has been my true education. I look forward to applying the knowledge I have gained of intricately minute and incredibly massive ecological systems in a way that creates real change, both politically and educationally. 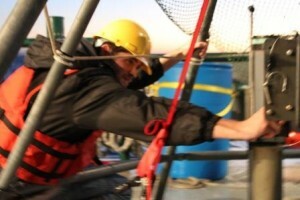 Enough of the esoteric stuff, I’ll get back to the business on the boat. I am here not for my own research, but to provide assistance for some fellow researchers. on deck (sometimes they are mud, sometimes sand, depending on depth), we slice them up, bag the sections, and freeze them to save them for analysis when we get back to our lab at FSU in a week or so. 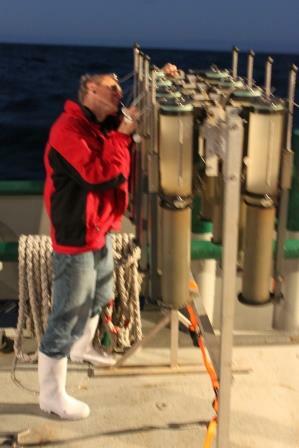 I have also been tasked with pumping seawater from the surface of the cores through specialized filters. When we are back in the lab scientsits can tell if there are oil-degrading bacteria living in the water. Remember the oil spill? Print article This entry was posted by greely on February 10, 2013 at 11:16 pm, and is filed under Oceanic Updates. Follow any responses to this post through RSS 2.0. You can leave a response or trackback from your own site.